Halley's Comet passed perihelion in its eighth known passage, as determined from records by Chinese astronomers. Adoption of the metre as the basic unit of length, and of the metric system in general, was first given a legal basis in France. H. P. Tuttle discovered asteroid #73 Klytia. V. Knorre discovered asteroid #215 Oenone. The first long distance public television transmission was made, using telephone lines, from Washington, DC to New York City; the image transmitted was of Commerce Secretary Herbert Hoover. On 7 April 1927, live TV images of Secretary of Commerce Herbert Hoover were sent over telephone lines from Washington, D.C. to "television screens" at Bell Telephone Laboratories in New York City in the first U.S. public demonstration of long-distance television transmission. The image was displayed as tiny dots of light on the 2x2.5 inch face of a neon glow lamp. See a picture of the scene in the transmitting studio. N.B. : The photograph on this page is of far greater quality than the image transmitted over the wires at the time. The largest sunspot ever observed was photographed, roughly 18 billion square km in area, an amazing 6,132 millionths (0.6%) of the visible solar disk, more than 36 times the surface area of the entire Earth. J. A. Brouwer discovered asteroid #1660 Wood; and K. Reinmuth discovered asteroids #2214 Carol, #2278, #2652 Yabuuti and #2806. RADAR was first bounced off the Sun, from Stanford, California. P. Wild discovered asteroids #1773 Rumpelstilz, #1830 Pogson, #1831 Nicholson and #2138 Swissair. USSR launched the Luna 14 orbiter to the Moon. Luna 14 was launched 7 April 1968. The spacecraft entered a 160 x 870 km Lunar orbit with an inclination of 42 degrees at 19:25 UT on 10 April 1968. The spacecraft is believed to have been similar to Luna 12, and the instrumentation was similar to that carried by Luna 10. It provided data for studies of the interaction of the Earth and Lunar masses, the Lunar gravitational field, the propagation and stability of radio communications to the spacecraft at different orbital positions, Solar charged particles and cosmic rays, and the motion of the Moon. This flight was the final flight of the second generation of the Luna series. The Internet's symbolic birth occurred with the publication of RFC 1. J. A. Bruwer discovered asteroid #1794 Finsen. The first spacewalk of NASA's Shuttle program took place when astronauts Peterson and Musgrave spent about four hours, 17 minutes working outside the Challenger orbiter during the STS 6 mission. Challenger's first launch was originally set for 20 January 1983, but was postponed due to a hydrogen leak into the number one main engine aft compartment discovered during a 20 second Flight Readiness Firing (FRF) on 18 December 1982. Cracks in the number one main engine were confirmed to be the cause of the leak during the second FRF performed 25 January 1983. All three main engines were removed while the Shuttle was on the pad and the fuel line cracks were repaired. Main engines two and three were reinstalled following extensive failure analysis and testing, while the number one main engine was replaced. An additional delay was caused by contamination to the Tracking and Data Relay Satellite-1 (TDRS-1) during a severe storm. The launch of STS 6 on 4 April 1983 then proceeded as scheduled. 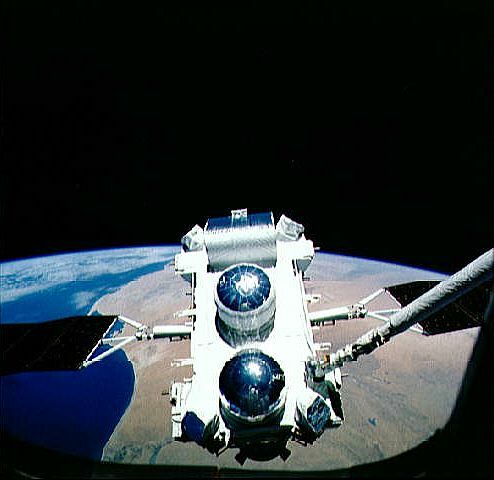 The primary payload for STS 6 was the first Tracking and Data Relay Satellite (TDRS-1). A malfunction of the Inertial Upper Stage booster resulted in placement of the spacecraft into an improper but stable orbit. Additional propellant aboard the satellite was used over the next several months to gradually place TDRS-1 into its properly circularized orbit. The first space walk of the Shuttle program was performed on 7 April 1983 by Peterson and Musgrave, lasting about four hours, 17 minutes. Other payloads on STS 6 were: Continuous Flow Electrophoresis System (CFES), Monodisperse Latex Reactor (MLR), Radiation Monitoring Experiment (RME), Night/Day Optical Survey of Lightning (NOSL), and three Get Away Special (GAS) canisters. This mission used the first lightweight external tank and lightweight solid rocket booster casings. STS 6 ended on 9 April 1983 when Challenger landed on revolution 81 on Runway 22, Edwards Air Force Base, California. Rollout distance: 7,244 feet. Rollout time: 49 seconds. Orbit altitude: 184 nautical miles. Orbit inclination: 28.5 degrees. Mission duration: five days, zero hours, 23 minutes, 42 seconds. Miles Traveled: 2.1 million. The orbiter was returned to Kennedy Space Center 16 April 1983. The flight crew for STS 6 was: Paul J. Weitz, Commander; Karol J. Bobko, Pilot; Donald H. Peterson, Mission Specialist; F. Story Musgrave, Mission Specialist. Ronald E. Evans (10 November 1933 - 7 April 1990) was a NASA astronaut who occupied the Command Module pilot seat of Apollo 17, the last manned Apollo mission to the Moon. He holds the record of more time in Lunar orbit than anyone else in the world, as of 2015. Captain Evans was one of the 19 astronauts selected by NASA in April 1966. He served as a member of the astronaut support crews for the Apollo 7 and Apollo 11 flights, and as backup Command Module pilot for Apollo 14. Evans was also backup Command Module pilot for the Apollo-Soyuz Test Project (ASTP) mission. He retired from the United States Navy on 30 April 1976, and remained active as a NASA astronaut involved in the development of NASA's Space Shuttle Program. He served as a member of the operations and training group, within the astronaut office, responsible for launch and ascent phases of the Shuttle flight program. Evans retired from NASA in March 1977 to become a coal industry executive. NASA's Compton Gamma Ray Observatory was deployed into Earth orbit from STS 37. 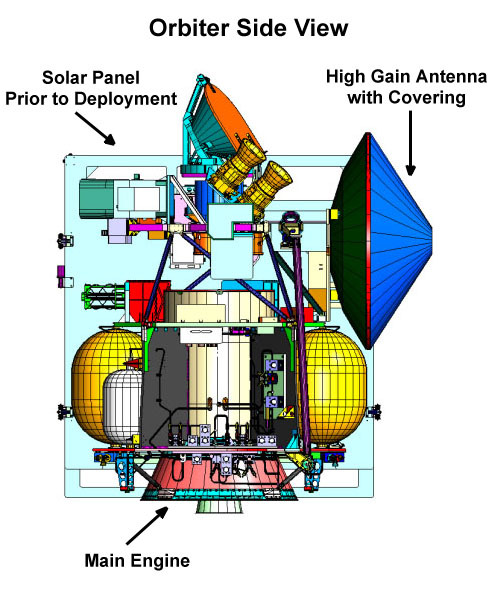 NASA launched the 2001 Mars Odyssey orbiter.